My short stay in Rajasthan passed me by in a colourful blur of auto rickshaws, smells, spices, and breathtaking architecture. India’s rich culture is easily exhibited in its majestic forts, incredible food, and royal palaces but perhaps most delightfully, in its jewellery and textile traditions. Rajasthani dress is particularly elaborate and colourful, beautifully decorated with mirror and traditional printwork. For women, the textile traditions manifest as adornment on sarees, lehengas, and cholis. Throughout India, each region and city have different traditional methods of making and designing clothes; in Rajasthan, two of the most distinctive and traditional patterns are leheriya and bandhani. Leheriya is a technique that produces brightly coloured cloth with distinctive patterns. Most often a zigzag-like pattern of irregular colour stripes made by lightly binding threads before the cloth is dyed. This process is repeated until the material displays the desired number of colours. Ever poetic, the leheriya technique gets its name from the Rajasthani word for wave, which can be understood from looking at the resulting garments. Bandhani is the art of tying small dots onto a fabric by plucking the cloth with a fingernail and dyeing it, leaving a disordered, technicolour mix. A refined, highly skilled process, the Bandhana technique can be used to create a variety of patterns. These textile techniques are purported to have been used to create varying results since as early as 4,000 BC and are still worn across India to this day. Follow Isabelle here and here. As you walk down the streets of Udaipur or Jaipur, amongst the beeping of horns, and the hustle and bustle, so the story goes that you will most likely hear Indian women before you see them. Clinking bracelets, chiming waist ornaments, and beautiful nose rings are but a few of the pieces that you will see on the locals. Having a collection of beautiful and well made jewellery is an indicator of power and wealth in Rajasthan. When a woman marries, for example, her bridal look is considered incomplete without a nose ring or nath, the style and design of which is seen to convey her family’s status. The women I met during my time in Rajasthan told me that the beautiful jewels they adorn themselves with are not only a customary tradition but are also designed for their scientific and holistic properties. For example, it is believed that piercing the left nostril can alleviate the pain of childbirth, due to the nerves on the left hand side of the body connecting to the female reproductive organs. Jewellery then, is much more than a mere adornment, each piece worn serves multiple functions. 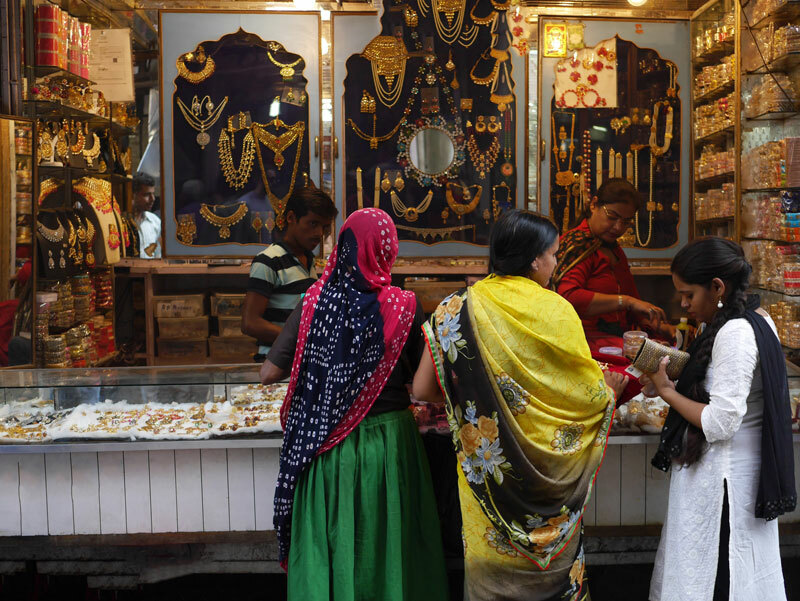 No matter of what occupation or status, the people of Rajasthan are always bathed in colour, and jewellery. An array of wonderful colour with gold threads, silver threads, and dazzling mirror-work. Throughout the centuries and millennia, amazing craftwork has created such beautiful India textiles, and the craft that goes into producing Rajasthani fabrics and textiles is only highlighted by the pride with which they are worn.